Convert An Existing Bucket Into A "CONTRACTOR" Grapple Bucket! The "Contractor" Add A Grapple Skid Steer is heavy duty and designed for use with Skid Steers. The curved tines allow for a wider grip and easy release of material. The tine gussets follow the contour of the tines for added strength. Two welded cylinders with hose guards and hoses with hose guards are included. See our Grapple Spec Sheet and Add A Grapple Selector below to choose the correct Add A Grapple for your bucket. Do you want to add a grapple to your existing bucket or remove your bucket and attach a grapple rake? Do you have auxiliary hydraulic outlets? If not, see accessories for Xtra Valve Kit. If you have a set of outlets in the rear of your tractor you might want to run a set of hoses from those outlets to the front of your tractor. Conceal them and secure with cable ties so the hoses do not get in the way. Now you can put couplers on the ends and have a disconnect point at the front of the tractor instead of having long hoses to manage. How do you intend to use the grapple? Cleaning barns, picking up loose hay, moving round hay bales, brush or construction debris? Choose the right grapple for your job. 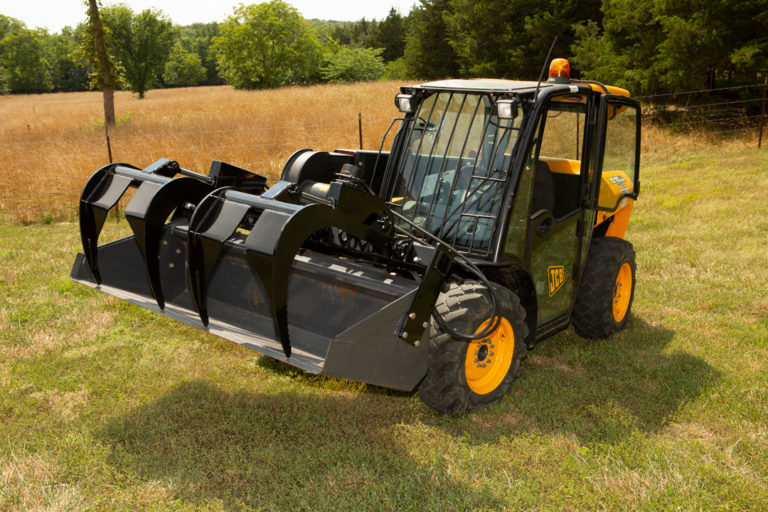 What is the lift capacity of your loader? Choose a grapple that is less than 50% of your loader lift capacity but still strong enough to do the job. What is your price range? This is a slippery slope. Choosing a low price grapple may cost you more in the long run, plus frustrate you. The width of the opening may be the most important feature of a grapple. A wider grapple opening means you can grab more material. Some are even wide enough to grab large round bales. Spacing of tines is important. For brush we think 6” is ideal. It is wide enough to sift the dirt yet tight enough to hold smaller brush. For rock buckets we think 3” is ideal for the same reasons. Single grapple or double grapple? We sell far more doubles than singles. Mainly because with a double grapple you can clamp down on uneven loads. Almost all brush loads will be uneven. A single grapple may be preferred for picking up even material such as hay bales. A grapple that weighs over 50% of your lift capacity may limit the material you are able to carry. Choose one slightly less than 50%. Getting one too light will be costly in the long run. Precision Manufacturing warrants all new products manufactured and/or marketed by Precision Manufacturing to be free from defects in material and workmanship under normal usage and service for one year from the date of first use by the buyer, or for one year from the date of the purchase as indicated on the receipt/invoice, whichever occurs first. Repairs or replacements covered under this warranty shall be warranted for the remaining portion of the original warranty period or ninety (90) days, whichever is longer. 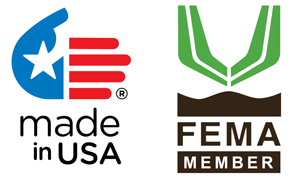 This warranty shall apply provided the products are returned to Precision Manufacturing’s designated facility freight prepaid. This Warranty excludes all products or component parts that, in the opinion of Precision Manufacturing, have been subjected to negligent use, misuse, alteration, or accident, or that have been repaired with component parts other than those manufactured or used by Precision Manufacturing. Precision Manufacturing does not warrant component parts supplied by manufacturers who provide separate warranties for their merchandise. It is the obligation of the buyer to contact these suppliers directly for warranty claims, service, and replacement of defective materials and component parts. Precision Manufacturing reserves the right to make design changes, improve design, or change specifications at any time without any contingent obligation to owners of products previously sold by Precision Manufacturing. This Warranty shall not be interpreted to render Precision Manufacturing liable for injuries or damages of any kind, direct, consequential, or contingent, to persons or property. Precision Manufacturing shall not be liable for any recovery greater than the cost of repair of defects in workmanship. Precision Manufacturing shall not be held responsible by buyers for failure to perform any of the obligations of this Warranty if such failures are the result of circumstances of Force Majeure, such as, but not limited to floods, earthquakes, transportation strikes, labor disputes with outside suppliers, or any other conditions beyond the control of Precision Manufacturing. Warranty service is available by contacting your dealer or distributor. This Warranty gives you specific legal rights and you may have other rights.